Extend from $.fn.datagrid.defaults. Override defaults with $.fn.datalist.defaults. 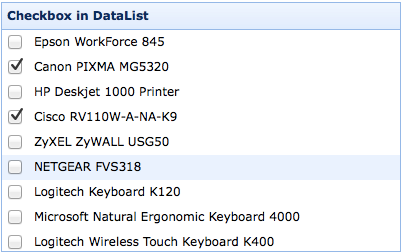 The datalist renders items in a list. It is a special datagrid that displays data in one column. You can define the column format and style for each rows. The properties extend from datagrid, below is the added properties for datalist. groupField string Indicate what field to be grouped. row: the row record data. value: the group value defined by 'groupField' property. rows: the data rows according to the specified group value. The events extend from datagrid. The methods extend from datagrid.